Discover Norris Lake At Our Peaceful Log Cabin Retreat! Our secluded, spacious 2200 sq/ft., lakefront home offers exceptional mountain and lake views with all the modern amenities. Whether it's a memorable family vacation, a trip to the local ATV parks, a romantic get-away or that long-awaited fishing trip, our home is the perfect setting. Our home sleeps 14 guests comfortably. Escape to the Foothills of Tennessee and Enjoy Year Round Water. Have your morning coffee and watch the sunrise while relaxing on our deck, fish off our private dock or rent a boat from the nearby marina and enjoy a day of fun on the water. We also have plenty of space to park multiple trailers, so be sure to bring down your ATVs and boats! We have been vacationing with our friends and family to various lakes our entire lives. While the lakes in Ohio, Michigan and Kentucky, all offer something unique, nothing captured our attention like the first time visiting Norris Lake. During our first trip to Norris Lake, with a group of our friends, we immediately fell in love with the clean water and mountain views. By the end of the trip, we knew this was the place we wanted to call our second home. In the coming months, we worked hard to make that dream a reality. We truly appreciate the journey, the friendship, and the memories to come. We are excited to share our home with you, and provide a place for you and your loved ones to make your own memories. We hope to hear from you, and thank you for stopping in! We are just minutes off of I-75, but our property sits on an acre of land, with a beautiful view of Norris Lake. Plenty of space to feel secluded, yet close to everything you need. Stunning views from each bedroom and from our 2 decks. With private dock access. There are stairs and an incline to the lake. May not be suitable for those with special physical needs. Large level driveway with parking for plenty of cars or trailers. Bath Towels provided for 12 people, please bring your own towels for the lake. Large french door refrigerator, with freezer on bottom. Total indoor seating with Breakfast Bar is 12, outdoor dining 8 at the table, additional chairs available. Yard is sloped front and back with walking path and stairs down to the lake. Firepit overlooking the lake. Boat rental available at the nearest Marina. A covered dock featuring 2 boat slips will be added before summer 2018! 2 decks, with main level fully covered. Ice machine available during summer months on the lower deck. I stayed here with 6 other guys for a fishing weekend getaway. Trisha was very good about answering any questions that I had throughout the booking process. Even though the weather did not cooperate some days, we did not feel cramped sitting out on the deck or making dinner. The new dock is great and there were kayaks available for the calm portion of the lake. The only word of warning is to be aware that there are steep steps down to the dock, so make sure you have everything you need before going down to the dock! We stayed here 9 days with three different families with 6 kids ranging from 3-15 years old. It was great each couple had their own room and bathroom on separate levels of the house. Kids loved the loft area! Also nice was having two living rooms to visit in and letting the kids play in the basement living room! Great location. Beautiful house. Owners were very fast to answer and questions and concerns we had. Driveway had plenty of parking for three trucks and trailers - although it is a little steep at the end and the trailers would sometimes scrape getting in and out - but not a big deal for us. We went riding at the local ohv parks and it was a nice location - pretty close to all of them. You do have to trailer your rides as there is no riding on the roads in Jacksboro. Fire pit was great to sit and visit at. A few kids fished off the dock and loved it - it is a steep hike to get down to the dock. WiFi and smart TV’s worked great! Plenty of pans and utensils in the kitchen. We had a wonderful time and enjoyed finding such spacious place to all be able to stay together! 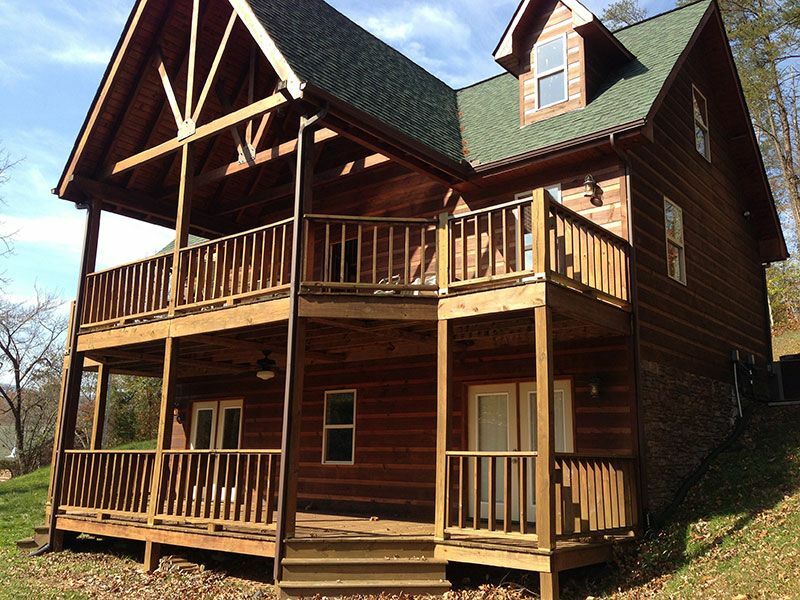 We rented this cabin for 12 of us to stay and ride 4-wheelers at Windrock ATV Park. We loved staying here and hope we can come again. We had everything we needed except food. :) Trisha was very quick to respond to all of my questions. I was the only one to climb the steps down to the lake, it was a good way to get exercise in the morning. I just wish the weather had been nicer for our ride, however it did allow for us to relax more in the cabin. Thanks again Trisha for allowing us to stay in your beautiful cabin. Trisha and Greg were great to work with to arrange our week on lake Norris. We rented this beautiful cabin for a week in February while I commuted to work in downtown Knoxville. It was a 30 minute drive from the cabin to the office. Perfect! The cabin is very spacious, well appointed and very comfortable. The view of the lake was very nice. We will definitely come back when the weather is warmer and we can enjoy the outdoor living areas and water activities. Great dock and access to the lake. The property was beautiful, full amenities, and plenty of activities to keep my family entertained! My family and I had an amazing time at the property. The cabin came fully equipped with everything we could possibly need. Many memories were created, and we are strongly considering coming back during the summer to enjoy the lake! We were in town for Cross Country Nationals at Victor Ash Park and didn’t want to be cooped up in a hotel. We couldn’t have chosen a better spot for our three families to enjoy the weekend! I appreciated the fully stocked kitchen and loved the open concept that allowed me to socialize with everyone as I prepared 14 omelets on the island gas cooktop. We also took advantage of the gas grill and a spectacular view of the lake for dinner. The weather was just warm enough to kayak for a bit and the kids took a quick polar bear plunge off the slide. The bunk room was ideal for our 8 kids while the adults each had their own bedroom and bathroom. The house was clean and had all the amenities. Trisha was so kind and easy to work with. We will treasure the memories we made at Norris Lake and would definitely love to return! Beautiful Norris Lake, a great place to relax and enjoying fishing, water skiing, wakeboarding, wake surfing, paddle boarding, swimming or hiking. Reservations may be made up to 12 months in advance. Peak Season dates require 1 week minimum stay. In Season and Holiday dates require a 3-night minimum stay. Off Season dates require a 2-night minimum stay. Tax and fees not included in rates. 9.25% TN Sales Tax + 5% Lodging Tax will be added. Contact us today to book your Norris Lake Hideaways vacation!